Will Return on Investment (ROI) be replaced by the much more penetrating Return on Reconciliation (ROR) index? "Give me a high performing organization” is an often quoted sentence by a CEO to the CHRO. “Yes we’ll try to do more with less people” is the old-fashioned answer. What is the alternative? Try to work on increasing the leadership’s competence to deal with opposites. Gradually, it is becoming clear that the pure financial view is much too limited to capture the quality of an organization. Return on Investment has shown to be too one-sided. Once it was Scientific Management that reigned organization theory, but it committed suicide because of extremism in the late thirties. A human organization is just more than a collection of rational robots that need to operate in a most efficient way. The end of the story is very similar to the pure human look that dominated the fifties and the sixties. We listened to theories about motivation by Maslow, McGregor, and Herzberg. This school killed itself as well because of the exaggeration by sky-high subsidies for organizations that couldn’t survive otherwise. Subsequently, in the seventies, it was the client that became the king and reigned the logic of organizations, while less than twenty years ago, the era of the tunnel vision of shareholder value began as the value was created for people who never share. Anonymous money shufflers thought one could become rich without adding any value and employees were being judged on their contribution to corporate profit. This monolithic model as well destroyed itself. After the era of the ‘homo efficientis’, the ‘homo humanis’, the ‘homo clienteles’ and the ‘homo economicus’, the time came for the ‘homo socialis’. Corporate Social Responsibility became the buzzword and again in most cases, at the cost of the other stakeholders. And the HR professional following blindly the next fashion. What a shame because I predict that it will too self-destroy just like the other monolithic paradigms. Time has come for an organizational mindset where actors integrate opposites: the ‘homo reconciliens’. It is the actor that works in organizations where opposites, dilemmas, and trilemmas are reconciled on higher levels. We have always wondered how the value of an organization where employees, suppliers, clients, shareholders and society meet, can be determined by a relatively small group of short-termish movers of money or sandal-wearing veganists on a bike. But what is the alternative way of determining value? Very much in line with the criteria of good individual leadership, we need to fundamentally redefine and re-equilibrate the criteria for the quality of the collective organization. And in order to ascertain the essential qualities of a leader, we need to judge how well this person integrates opposites in tension. An effective leader will use emotions to increase his or her power of thinking, will use analysis in order to test the larger whole, and will also use imagination in order to make realistic decisions. The same applies to organizations in which these leaders operate. 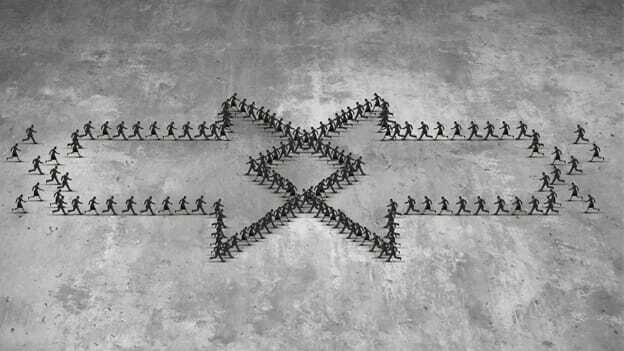 In our consulting practice, we have analyzed more than 40,000 tensions and dilemmas that organizations fight with. From these thousands of outputs, we have selected ten golden dilemmas. We have done experiments in this area with ten blue chip organizations to research whether we could map the value of an organization in an alternative way by the degree to which these organizations integrated the tensions. We hoped that the average scores will give us a much better insight than the pure financial and technical analyses. In this way, the reconciliation of the dilemmas between the efficiency of the internal organization and the development of the employees is of prime importance for the value of an organization. Here, the homo efficientis meets the homo socialis. On the field of tension between financial short-term results and investments for the long-term, the homo economicus meets the homo clienteles. The development of technology needs to reconcile itself with the demand of the market in such a way that the market helps decide what technologies to push. On the other hand, the push of technology will need to help determine by what markets one wants to be pulled by. The need for consistencies in the global organization needs to be fine-tuned with the need for local flexibility and sensitivity. In other words, the homo clienteles needs to be integrated with the homo efficientis. The last example relates to a simultaneous high score on both specializations in supply and the value added to the organization by a broad assortment of products. 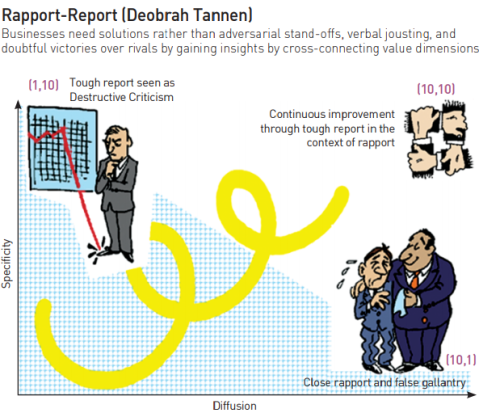 Only employees have scored the ten ‘reconciliation scoreboards’. Very soon, we will ask clients, suppliers, employees, politicians, and financial analysts to provide their opinions and score the organization on the ten golden dilemmas. This might lead to an alternative new “ROR” index that will eventually push away financial-technical analyses. Historical indices are being enriched by future potential. Return on Investment (ROI) will finally be replaced by the much more penetrating Return on Reconciliation (ROR). It is time. The last 15 years of research has given us the opportunity to look at the dilemmas that were raised by our clients. We have asked all participants to our workshops to submit our so-called webcue. As preparation, they were asked to reveal the issues, challenges, problems they were facing in business and were asked to phrase their challenge as “on the one hand…….on the other…..”. In other words, we tried to force the participants to see their problem and issues as a dilemma. It should be a simple matter to increase the strength of all five segments but unfortunately, strong tensions exist between the five segments — Employee learning and innovation point to the future; shareholder rewards and financial performance are reckoning about the past; and funds paid to employees cannot be given to shareholders, cannot be spent on technologies and systems, cannot be rebated to customers. We have identified ‘10 Golden Dilemmas’, which exist between these five segments of our cycle. These dilemmas exist because resources are scarce. What is given to one segment of the cycle must be taken from another. Yet paradoxically, values are abundant or potentially so. The more innovative employees are and the faster they can learn, the better they will do on benchmarks. If these benchmarks are accurately aimed at what customers want, then customer satisfaction will rise, shortly after higher levels of quality are attained. The revenue generated by satisfied customers will increase shareholders rewards, raising their readiness to invest. People create value using scarce resources in combinations that render the total solution more valuable than the resources from which it came. They offer these to customers. Hence, while the resources are scarce, the solution exists with created value, in many cases new value, where this particular combination has never before been attained and gives the customer a unique advantage. We are now to create ten dimensions out of our five segments each one of which is connected to the other four. Each segment is connected to at least four others. The value conflicts between these segments, precipitated by scarcity at moments of time, have to be reconciled over time. It is difficult enough to resolve these dilemmas theoretically, but even this would not be enough to render the assessment methodology operationally. In order to do this, we need to demonstrate to assessors how the values we seek to reconcile should be measured. All dilemmas raised had a resemblance to how the internal organization prepared itself to be more effective to its environment. One of the most frequently discussed tensions is: on the one hand, the need for developing your people, and at the same time, being cost conscious. It is obvious that this first dilemma is crucial and is effectively inherent in the Balanced Scorecard introduced by Kaplan/Norton. Their scorecards consist of four entry points together making up two crucial dilemmas. The internal and external world of business processes versus the client on the one hand. On the other hand, there is the dilemma of cost reduction/efficiency versus developing people. The latter dilemma has been the most quoted dilemma by our 8000 participants over the period 2002-2008. During some consulting with AXA Insurance, coinciding with the first major recession in this century, the leadership of AXA was very worried by the extensive cost reduction programs they executed for many years. The cracks had begun to show as evidenced by a lot of talent leaving the company ‘because there was no seemingly investment in our top-people’. The balance was lop-sided. The effective leadership skills of Henri de Castries can be seen in the way he approached this dilemma. After we had presented a dilemma Reconciliation workshop that offers a methodology to elicit and deal with such dilemmas, he introduced an increase of 30% in all development programs, under one condition ~ all suppliers (including us!) had to demonstrate how their interventions would lead to cost efficiency. The reconciliation he created was as powerful as it was simple. By developing people in how to reduce costs you marry the best of both worlds. 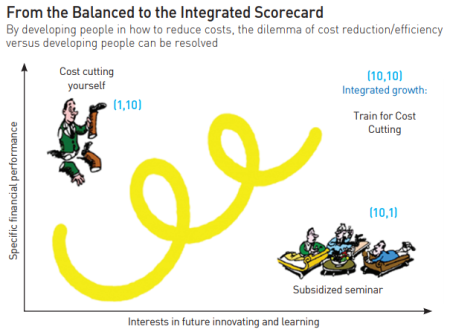 The balanced scorecard became an integrated scorecard. One core quality of today’s effective leaders is the competence to integrate the feedback from the market and the technology developed in the organization which motivates the employees, and vice versa. Again, it is not a competition between technology push or market pull. The modern leader knows that a push of technology will eventually lead to the ultimate niche market, the part of the market without customers. Conversely, a monolithic focus on the market will leave the leader at the mercy of its clients. Our thinking is that values are not “added” by leaders since only simple values “add up”. Leaders combine values: a fast and a safe car, good food yet easy to prepare. Nobody claims that combining values is easy, but it is possible. A computer that is able to make complex calculations can also be customer friendly. It is the more extended systems of values that will be the context in which international leadership will prove its excellence. Steve Jobs, co-founder of Apple, skillfully reconciled his dilemma in this area of inner- and outer-direction. We might even argue that the reconciliation of this dilemma accounted for much of the success of Apple. A strategy is an advanced form of inner-direction with powerful motives, steered from within. Steve Jobs has created a company that looked for the rare and valuable. Apple is always looking to find this ability coupled with its opposite, the readiness to understand, acknowledge and respond to the value-creating capacity of another system outside yourself. Steve Jobs always believed that a product needs to be beautiful because esthetics is what excites the client. On the other hand, his techies loved to come with sophisticated technologies. That motivates them the most. And what makes up for the success of Apple? Every engineer will ask the question: “How can our technology made beautiful”? And every designer will ask themselves: “Yes it is beautiful, but does it add to its functionality”? The resolution of these contrasting abilities accounts for the success of Apple in a big way. This tension has not been raised often in our database of dilemmas. That does not mean it is not an issue. 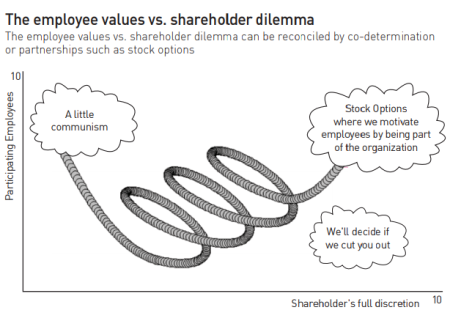 Option plans show that there is a need to get employees closer to the responsibilities of the shareholders. If one gives too much decision-making power to the employees, it becomes a lost democratic leadership with too little left for shareholders. Conversely, once shareholders get too much to say, employees are often underpaid and feel too much dependent on the last mood of the investors, such as their need to cut costs through headcounts. Obviously, reconciliation lies in a form of co-determination or partnership such as stock options. The grid looks as in the below graph. Deborah Tannen, an American anthropologist has made much play with the fact that men seek to report specific facts, while women seek a diffuse relationship of rapport with others. This is as simple as driving down the road and the woman passenger asking her partner, “Do you want to stop for a cup of coffee?” The man answers “No” and drives on past the coffee shop. She is annoyed. She would not have asked him if she did not want to stop. Her question was an invitation to negotiate. His answer was strictly factual. She asked him what he wanted. He told her. Note how tacit is the rapport sought by the woman, while his answer is explicit. In her later book, The Argument Culture, Deborah points out that while men are keen to debate and score points off each other and where possible demolish the points made by the opposing side, women are more interested in solutions and in the two parties accommodating each other. In practice both are needed, initial conflict to clarify the choice followed by negotiated consensus between these complementary values. If this is true, then businesses too need solutions rather than adversarial stand-offs, verbal jousting, and doubtful victories over rivals. We can gain insights by cross-connecting these value dimensions. In dealing with the diversity issue more effectively, Tannen argues that it is best to first go for positive discrimination like hiring minorities by complying to numbers, but after that, to go for harsh and honest criticism. So report within the context of rapport. This bet shown in the above graph. Fons Trompenaars is a Dutch-French organizational theorist, management consultant, and authorin the field of cross-cultural communication, who developed the 7Dimension of Culture model forlooking at national culture differences.